Spring is finally here and our Spring Art Show starts today! The show will run April 1-3rd at the Polish American Citizens Club in Gardner. Do you believe this is our 16th Annual Spring Show! This is one of our biggest shows yet, so don't miss it. If you are looking for art on your walls this is the place to be. 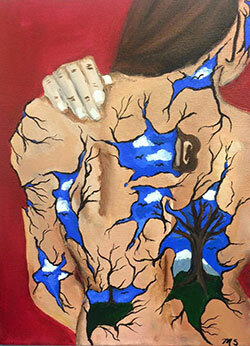 We will have art entries from four High Schools in the surrounding areas. We are excited to see their work too. We will also be officially announcing our BIG Surprise tonight (Friday) just before the awards. Come and find out what all the excitement is about. View wonderful art and enjoy fantastic live music. Please visit the show web page for more info including: Music Schedule, Silent Auction artwork, Artist Demos and Show Artists. Discover Your Imagination, a public sculpture project, created during C.M.Judge's residency at East Kingston Elementary School with 155 students is being featured on the NH Arts Learning Network website. "It was a joy to work with art teacher, Merrilyn San Soucie and a wonderful group of students. A 96' wall goes from bland gray to spirited color with the beauty and goodness of children's art!" 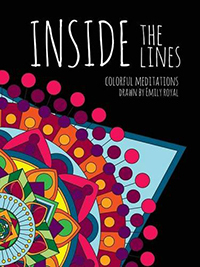 Emily Royal has self-published an adult coloring book "Inside The Lines: Colorful Meditations." It is available through lulu self publishers and can be found at the following web address: http://tinyurl.com/hc8zrbg. Emily is a graphic designer who daylights at The Gardner News and moonlights as a freelance graphic designer and illustrator at her home in Winchendon, Mass. For more information about the artist, you can find her @crazyowlem on Instagram or online at http://royalsnapshots.wix.com/emilyroyal. She can also be reached through e-mail at indigo.imagedesign@gmail.com. 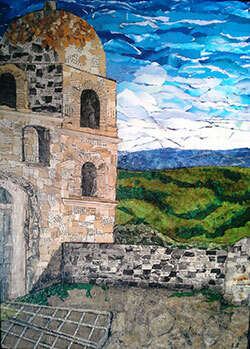 Paper Artist, Keila Ploof, will be exhibiting her artwork during regular business hours at the Center for Wound Care, Heywood Hospital, 250 Green St., Gardner, MA, for the months of March and April, 2016. Keila "paints" using paper to create unique works of art. Her subject matter is varied; from figures to Italy to farms. Texture plays a dramatic role, the raking light changes the works in new and exciting ways. A must see in person! Joanne Holtje, along with three other artists will be featured at the Amy H. Carberry Fine Art Gallery in a show called Playscapes. This show invokes the sense of place or elements of the natural world, but through less traditional representations that encourage the viewer to be aware of their relationship to the world around them. 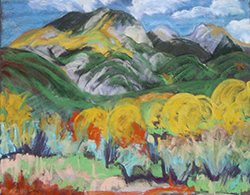 These landscapes are created for play, imagination, reflection, and personal moments. 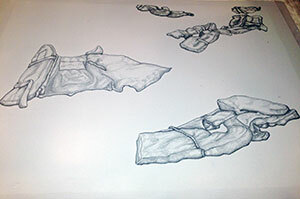 Reception March 22nd 11:30 a.m.-1 p.m.
Gallery Hours: Tuesday-Friday 12:30-4:30 and Saturday 10-2 p.m. Experience Natasha Hanna's photographic art at Nina's Nook from March 31 to May 7 in her exhibit called "On the Cusp." Hanna's lens brings the viewer into a magic world through a focus on the everyday scenes transformed with digital artistry. "My photos are on the cusp of dream and reality...the line in-between is so vague." Meet the artist at a closing reception at the Nook on Saturday May 7, 5-7 p.m. Nina's Nook is open Thursday through Saturday from 12 to 5 p.m. and by appointment: 413.834.8800. 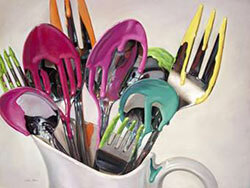 It is located at 125A Avenue A in Turners Falls, next to the Black Cow Burger Bar and online at ninasnook.com. Please join us at the Post Road Art Center for the free opening reception of the Perspective Exhibit on Thursday April 7th from 5:30-8:00 pm. There will be plenty of great artwork, refreshments, and good company. All artwork is for sale and on view in our gallery until April 28th. The Jaffrey Civic Center is pleased to announce a Young Artist Spotlight exhibit which will showcase the work of local young artists under the age of 30. 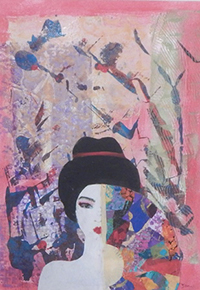 The debut exhibit of Micella Carla Statuto, will include her mixed media work titled, Eclectic- A Retrospective Exhibition in the first floor Display Cases beginning March 11th through April 7th. 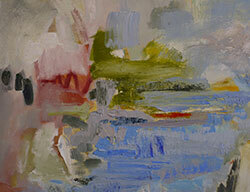 An Opening Reception will be held on Friday, March 11th from 5pm to 7 pm. A native of Peterborough, Micella graduated with a BA in Studio Art from the University of North Carolina at Wilmington, where she hungrily delved into every facet of art, from painting to welding. As the daughter of a physician, the study of human anatomy highly influences her surrealist pieces, in particular. She is a self-taught jeweler, and is currently pursuing a career as a professional art teacher. She recently completed an internship at the Jaffrey Rindge Middle School where she was an Art teacher intern. In addition, her jewelry can be found locally at Alice Blue in Peterborough. Statuto breaks through boundaries and challenges conventional thinking and ideas with each interesting and dynamic piece, and her need to convey a vast array of profound and sometimes uncomfortable emotions is what truly drives her work. Her passion for artistic expression in nearly all mediums stems from her innate desire to visually communicate with a diverse audience, while positively impacting others. 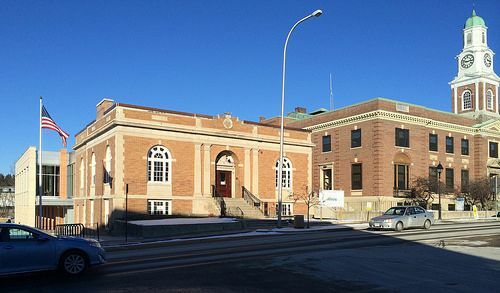 Lithography is returning to Worcester Art Museum! GALA member Corinne Rhodes of Cherry Press will be teaching two lithography courses focusing on new, non-toxic techniques at WAM during their upcoming Spring Session. Introduction to Lithography meets Tuesday evenings from 6-9 p.m. starting April 26 - June 14. Advanced Lithography will introduce new, non-toxic techniques to artists already familiar with the art of lithography and/or experienced printmakers and meets on Thursday evenings from 6 - 9 p.m. starting April 28 - June 16. These classes are both eight sessions long and an incredibly good bargain. If you have questions about the classes at WAM or would be interested in learning one-on-one or renting printmaking studio time at Cherry Press please email Corinne at: corinne@cherrypress.org. 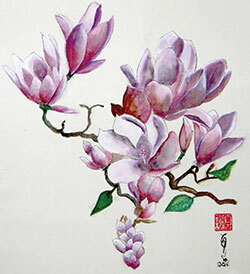 Petersham Art Center is sponsoring two classes in April to welcome spring. 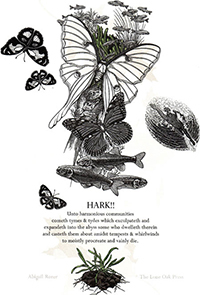 On Sat, April 9, from 10AM-12Noon, Lynn Hartman of Hartman's Herb Farm in Barre will help participants create a Fairy Dish. 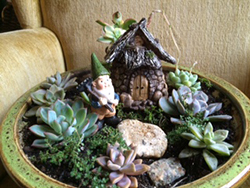 Using sedum moss, decorative plants, a garden dish, and of, course, fairies, the class will take home their own miniature wonderland, for inside the home or to display in the outdoor garden. The cost is $15 members, $35 nonmembers, with a $30 materials fee. 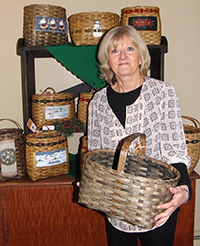 On Sat, April 16, from 9AM-12Noon, Sue Morello from Sheldon Farm Baskets in Barre will return to teach yet another of her ever-popular basket classes. This class will make their own flower-gathering basket to heap spring blooms into from the garden. The cost is $15 members, $35 nonmembers, with a $15 materials fee. Call the Petersham Art Center, 8 North Street, at 978-724-3415 for more information and to register. Acclaimed artist, Jeannette Martin of Petersham, will be the second artist to share her personal artistic adventures and world-view of art in the Petersham Art Center's Four Fine Artists, Four Fine Teas series, on Tuesday, April 5, from 3:30-5PM. The series is sponsored in part by a grant from the Petersham Cultural Council. 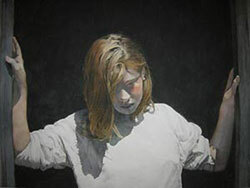 Ms. Martin has studied art at Bennington College, City College of New York and the Art Students League of New York. 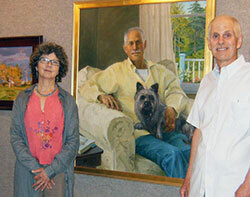 She also maintains her own art gallery in Port Clyde, Maine. 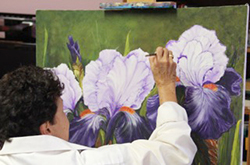 She has worked her artistry in oils, watercolors, acrylics and many other mediums for her renderings of still lifes, portraits, landscapes, and the everyday passages of daily life. The tea and artist talks will continue with Janet Palin on June 7th. These fine artist talks and teas are sponsored in part by a generous grant from the Petersham Cultural Council. Tax season is approaching and handling the financial aspects of a creative career can be daunting. This workshop, led by Anna Koon, will cover topics like deductions for artists, year-round bookkeeping, creating a budget, taxes and accounting tools. Participants will walk away with a confident understanding of how to effectively handle their finances, no matter how big or small their business aspirations. In addition to her career as a full-time painter, Anna is a board member and educator for the Jamaica Plain Arts Council. She is the Director of the Focusing Series, a "Partner in Residence" at Uforge Gallery in Jamaica Plain, and has developed workshops for the Arts & Business Council of Greater Boston, the Danforth Museum and ArtsWorcester. Through Creative Coaching, Anna has offered principled guidance and practical assistance to artists and entrepreneurs for over a decade. Participation is limited to twenty five, and registration is first come, first served. You must be a current member of ArtsWorcester to register. Please register by email. A wait list will be held. We thank the Melvin S. Cutler Charitable Foundation for its support of these workshops. 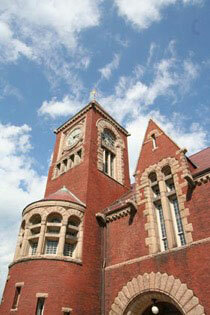 The Post Road Art Center will be hosting a juried exhibit in May. The theme of this upcoming show is Cultural Influence. As always, the theme can be interpreted in many different ways. Don't be afraid to think outside the box! Please visit our website for suggestions, submission details, and the registration form. Submissions will be accepted April 21 -28 until 7:00pm. The opening reception will be on Thursday May 26th 5:30-8:00pm. Cash prizes will be awarded to 1st, 2nd, 3rd, and People's Choice winners. 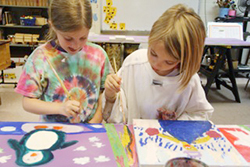 There are also opportunities to win gift certificates to Post Road Art Center. You are invited to participate as a donating artist in Family Health Center of Worcester's 18th Annual Art in the City Gala. The art auction gala raises funds to support needed health services for low-income families living in Worcester County and South Worcester County. Art in the City will be held on Friday, May 13, 2016 from 6:00 p.m. to 9:00 p.m. in Washburn Hall at Mechanics Hall in downtown Worcester. The Art in the City Planning Committee is seeking donations of original works of art for our silent auction. Donating artists are invited to join us as our guest for the evening of the gala. 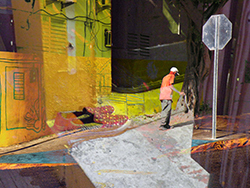 In an online gallery at artinthecity.org, community members will be able to preview your work, read your biography, and view links to your personal website before and after the event. Your biography will also be listed in our program booklet. 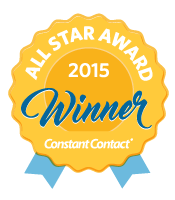 Please return the Call to Artists form no later than March 25, 2016.